I am the heart of Cape Breton. I am ever changing, ever the same. I grow by season and cycle to a new beginning in a regular changing circle. Death is a part of my circle as are birth and change. Learning by living is a part of life. Learn while you live and bring new energy to the cycle. The CEPI structure is shown below. 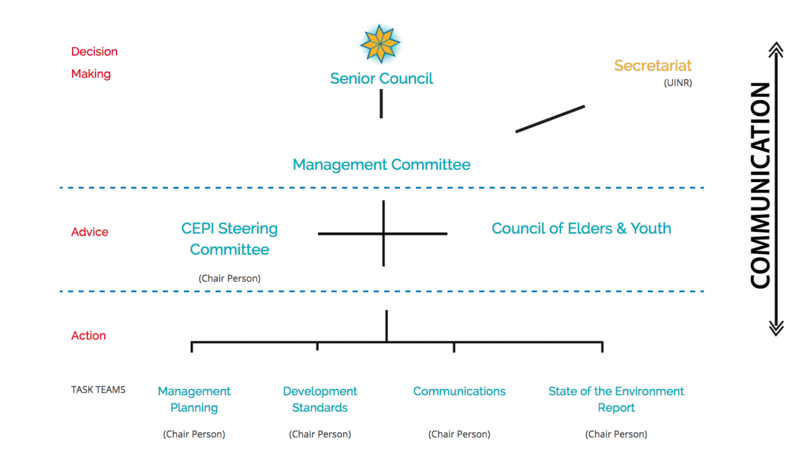 The structure is divided into the three separate categories of Action (Task Teams), Advice (Steering Committee and Elder’s Council) and Decision-making (Senior Council and the Management Committee (MC). The diagram is an illustration intended to assist the reader in understanding the authorities within the structure itself. 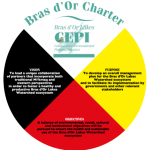 The CEPI will uses a circular planning model based in part on the Medicine Wheel, and in part on the practices of modern planning process theory. This circular planning operates on a one-year cycle. The starting point and end-point of the planning cycle is the annual meeting of the Senior Council normally held in the Autumn. The agenda includes a report card on the year’s activities, and a prioritized list of issues and projects for the coming year. A proposed work plan for the coming year and a budget is also presented for approval. In preparation for Senior Council, the Management Committee (MC) consults with the Steering Committee (SC) and the Elders/Youth (E/YC) during focused meetings held in September or October. The agenda for these focused meetings include issues and plans proposed for Senior Council by the MC. These meetings are the normal avenue through which Issues and Gaps Champions (see Chapter 6 of Spirit of the Lakes Speaks) can access the Senior Council. The Agenda may also include items raised by members of the SC or by the E/YC. The MC informs Senior Council members ahead of time about the issues to be presented. Minutes stating issues and decisions are prepared by the CEPI Coordinator, approved by the MC and posted on the CEPI website before the end of the calendar year. In January and February of each year the MC prepares a detailed work plan and budget. These are based on Senior Council’s decisions. In March, the work plan and budget is presented to the Steering Committee and Elders/Youth Councils for consideration, advice, and possible modifications. On April 1, the Task Teams Chairpersons receive their mandate on priorities for action and associated budgets. The Task Team Chairpersons coordinate the work of participating government staff and volunteers, taking into account their respective resources and abilities to contribute. Projects are expected to run year-round as required. Chairpersons provide quarterly updates on projects. Some projects, by their very nature, require more than one year to complete, but progress reports will continue to be provided quarterly. In September, the MC holds consultations with the Steering Committee and the Elders/Youth Councils. These consultations prepare the end of the cycle and form the initial phase of the next planning cycle. Approximately every five years, and/or upon a decision by Senior Council, the CEPI will hold public workshops for information and consultation purposes. At these workshops, the CEPI will report on achievements, and present updates on the issues and gaps being addressed. Proceedings of these workshops include reports on progress made against mutually agreed objectives through measurement in the environment. By assessing feedback, suggestions and advice collected during these workshops, the CEPI can assess whether it is still making progress or if a change in focus is required. The Proceedings of this gathering will be made available to individuals and organizations through the CEPI web site within two months of the workshops. The Bras d'Or CEPI offers a visionary way forward for maintaining the health of the Bras d'Or Lakes and its people. Creating a management plan for the Bras d'Or is at the heart of our efforts.